On Sunday April 7th, we mark the 65th anniversary of the World Health Organization (WHO). Each year, WHO uses the occasion to highlight a particular health issue; this year, they chose high blood pressure—hypertension. It’s a timely choice. Worldwide, at least one in three adults suffers from high blood pressure. That amounts to 68 million adults in the U.S. alone. Your blood pressure naturally rises and falls a bit during the day, but permanent high blood pressure is a dangerous condition that increases your chance of heart disease, heart attacks, strokes, kidney failure, and even blindness. Blood pressure is the force of the blood against the walls of your arteries. It’s an indicator of how hard your heart is working. Measured in milligrams of mercury, your blood pressure is recorded in two numbers. The top number, systolic pressure, is measured when blood is being ejected from the heart during a beat; the bottom, diastolic pressure, is the pressure in the arteries in between beats, when the valve above the heart is closed. The table below explains the ranges of normal vs. high blood pressure. Aside from taking medications, there’s quite a lot you can do to lower your blood pressure: eat less salt, drink responsibly, eat a balanced diet, maintain a healthy weight, don’t smoke, and exercise regularly. I would like to know something more about what causes this problem. 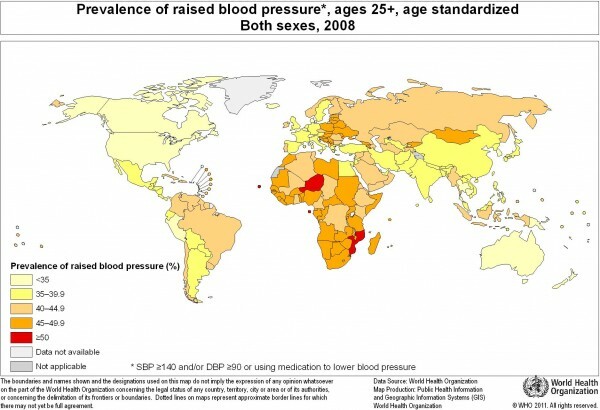 Q1 Why Niger has the highest blood pressure in the world? Q2 Is there a link between Niger food and the people and the blood pressure? Q3 Is there a link between the environment and the high blood pressure? I work in a community health clinic advising patients on healthy lifestyles. Many clients from the horn of Africa. Is the high incidence in Africa considered to be more genetics or lifestyle? Thanks for your thoughtful comments, Amadou, Chris, and Marianne! While we know that hypertension is a very common problem throughout Africa, we do not yet know why the problem is more widespread in one African country than in another. We do know that lifestyle factors, such as diet and obesity, are important. We also know that genetic factors play a contributing role. Researchers all over the world are currently hard at work trying to figure out the precise role of genes and environment with regard to hypertension. One common approach that NIH researchers are studying in Africa is the role of nurses and other community health workers in identifying individuals with hypertension and ensuring that they have access to effective lifestyle counseling, as well as, if needed, anti-hypertensive medication to lower blood pressure. High blood pressure can be genetic. African Americans have disproportionally high blood pressure than other races. Thanks for your comment, James! You are right that genetic factors can contribute to risk of high blood pressure. But we need to keep in mind that lifestyle factors, such as diet, exercise, and stress, also can play a role. Researchers are currently hard at work trying to figure out the precise roles of genes and environment in this common, chronic condition. please give information about the high blood pressure and their treatment through medicines and food etc. Other conditions such as pheochromocytomas [a rare tumor of the adrenal glands or certain nerve cells] could also lead to high blood pressure. The is mainly because of increased catecolamine release in such conditions. Generally, pheo are benign but in rare cases they could be metastatic. In our lab, we have identified a very accurate biomarker to predict metastasis in pheo patients at a very early stage. Education play a vital role in the prevention and management of high blood pressure. In order to get the message to the people in developing countries like Niger, public health workers need to be deployed and equipped. With support from government officials, public health workers can implement public health programs and act as a community liaison to disseminate health-related information. To comprehensively examine the issue of high blood pressure, we must look at the determinants of health. If generations live under undue stress, eat foods that you have to add salt to tolerate taste or have fatty foods in the diet, tolerate oppression from cultural norms or families/partners – those will adversely affect their blood pressure. Additionally, living in abject poverty with poor housing and environments that foster a constant flight/fight mode, bodies tend to become hypertensive. Approaches to addressing this must be multifaceted, political, social, economical & personal. Local persons, like community workers of the past, must be used to educate communities, tribes, and individuals about what leads to high blood pressure etc…. The prevalence chart goes from 35% upwards. That is still surprisingly high, if even the countries with the lowest amount of people with high blood pressure is 35% of the population and upwards. Good to see the WHO getting behind a fundamental health issue and promoting it. The devastating results of high BP (stroke, heart attacks, etc.) are topics that interest me as a First Aid Instructor – we attempt to teach people how to deal with these problems, and current courses also teach prevention (which wasn’t always the case). I’m wondering if this will be a topic of focus for the WHO all year, or just on world health day? If it’s to be all year, then I would certainly want to promote it further. As we can see from the chart, it’s a significant problem with (potentially) many unpleasant consequences. Sorry for the question, are medicines really useful to control this problem? Thanks for your question, Pietro. Yes, medicines are useful for controlling high blood pressure in many people. These medicines work in a variety of ways. Some remove extra fluid and salt from the body to lower blood pressure. Others slow down the heartbeat or relax and widen blood vessels. Often, two or more medicines work better than one. Can very high blood pressure occur without physical or mental symptoms? High blood pressure usually has no signs or symptoms. In fact, you can have the condition for years without knowing it. However, during this time, high blood pressure can damage your heart, blood vessels, kidneys, and other parts of your body. That’s why it’s so important to know your blood pressure numbers, even when you’re feeling fine. Blood pressure (BP), sometimes referred to as arterial blood pressure, is the pressure exerted by circulating blood upon the walls of blood vessels, and is one of the principal vital signs. When used without further specification, “blood pressure” usually refers to the arterial pressure of the systemic circulation. I have high blood pressure. I have had this condition from being 19 years old. I am now nearly 61. You will find that your blood pressure changes. I used to take my blood pressure several times a day which made me more stressed when it went up. If you need to take medication, you will get used to taking it and I know that some of the medication for high blood pressure also helps with anxiety. I have been an anxious person all my life so I think that when you are anxious your blood pressure goes up. I would try not to worry too much, but saying that is easier said than done. Hope this little bit of advice helps.